Serve up these Instant Pot pumpkin pie bites this holiday season! These bite-size pumpkin pies are an absolute delight. Graham cracker crust with tender pumpkin pie flavor that melts in your mouth. Grab your Instant Pot and egg bite molds and let’s get to cooking. These Instant Pot Pumpkin Pie Bites are seriously the best thing ever!!! These delicious little bites happened by pure experiment. One of my best bits of advice is to be creative with your instant pot. Do not be afraid to try ideas, that you think may work, sometimes the results are delicious and other times you may have a fail. I was recently testing out new recipes that can be made in egg bite molds. My first test recipe was a fail and I was definitely a little bummed out but these Instant Pot Pumpkin Pie Bites made up for my previous disappointment. One of my absolute favorite parts of the fall season are the scents that come along with it. I adore the smell of cinnamon and pumpkin spice. Bring on the baking! I could not have been more pleased when my natural release filled my house with the most delicious smells. 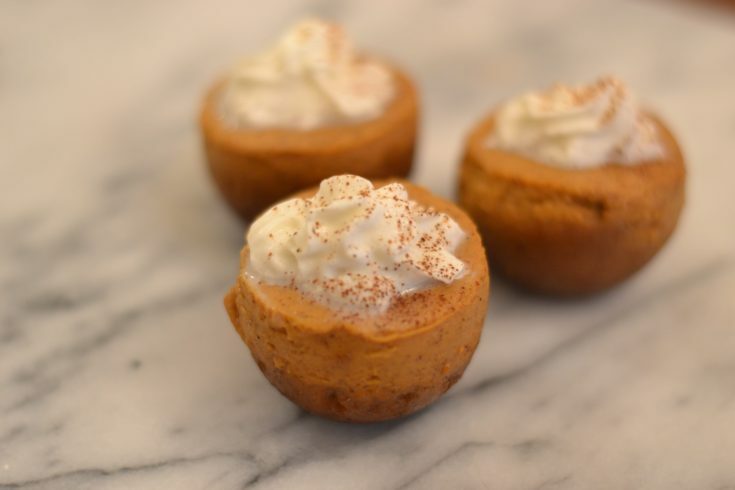 These pumpkin pie bites are like homemade pumpkin pies that are in bite-size form. They are the perfect addition to add to your holiday parties as an appetizer. The egg bite molds work great at holding that round shape. 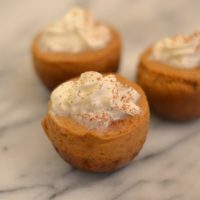 Top with some whipped cream and a sprinkle of cinnamon and serve up these adorable bites. Before you finish cooking your egg bites watch this egg bite mold cleaning hack video. Canned pumpkin puree is like gold. Not only can you use it for sweet fall recipes, but you can also take the savory route and use it as a base for a pasta dish and more. Pumpkin is packed full of nutrients and vitamins that are great to fuel and protect our bodies. I wanted to share some of the health benefits of that canned pumpkin you are buying! This is a great way to sneak in some added nutrients into your child’s diet, as well as yours. Pumpkin has beta-carotene which is very powerful! Most orange veggies that have this bold color carry the beta-carotene antioxidant. This is said to help ward off certain types of cancer, protect against heart disease, delay your aging, and help with asthma. Fiber is a must for our bodies, and most of us don’t get enough daily fiber in our diets. Fiber is great for regulating our bodies, helping with digestion, and fiber helps slow your sugar absorption into the blood. Canned pumpkin has over 7 grams in a can of pumpkin, which is amazing. This orange beauty is great at giving our body a little kick in immunity. Packed with vitamin C and antioxidants, it sure is great for fighting off infections. So now when you see that pumpkin spice and it uses real pumpkin, don’t hesitate! Now, these bites are not the lowest in calories, but pumpkin by itself is! If you like spending time in the kitchen maybe even try making your own pumpkin puree from fresh pumpkins. Canned pumpkin still will retain most of the health benefits even through the canning process. Pumpkin pie mix is totally different than pumpkin puree, so take note of that. What is your favorite way to eat pumpkin? Sweet or savory?! Here is a great video of me making this delicious recipe. For more delicious pumpkin recipes, click HERE to search the blog for more. 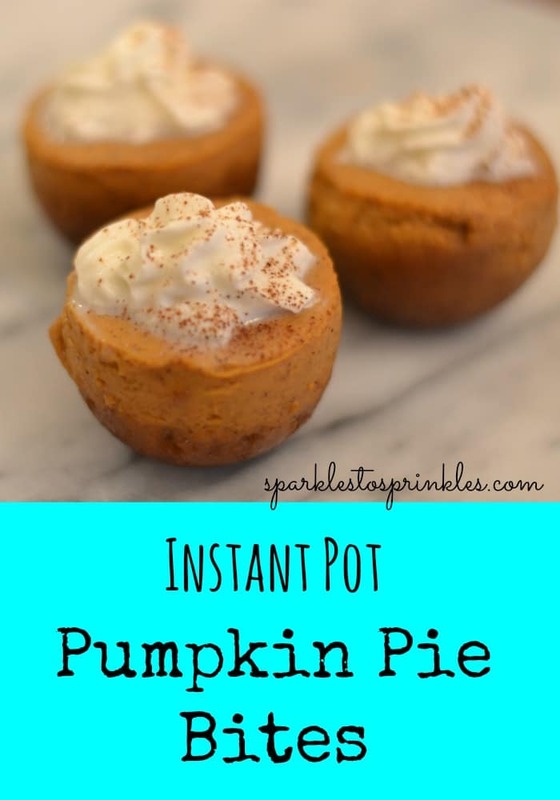 Instant Pot Pumpkin Pie Bites are so delicious and easy to make, no holiday is needed. You will want to make these weekly. Place 3 TBSP graham cracker crumbs in a small bowl. Add in melted butter, stirring to combine. You have enough butter when your crumbs will hold shape when pressed down. Spray egg bite molds with canola oil spray. Pour aprx. 1/2 TBSP graham cracker crumbs into egg molds, press down with a shot glass to firm up crumbs. Pour pumpkin puree into a large bowl. Add in evaporated milk. Add in salt and pumpkin pie spice. * Add in eggs and sugar. Blend mixture well. Pour into a cup with a spout for easier pouring into the egg bite molds. Pour pumpkin mixture into the egg bite molds. Pour just below the edge allowing enough room so that it does not spill while placing into your instant pot. Place your trivet into your inner pot. Pour 1 cup of water into your pot. Place your egg bites mold on top of your trivet. Close your lid and set to sealing. Set your pot to manual high pressure for 40 minutes. Do a natural release. Allow pumpkin pie bites to cool before removing them from the egg bite mold. Unless you are serving warm, them remove carefully. Turn the egg bite mold over and push down in the center of each mold. Allowing for easier removal of your pumpkin pie bites. Serve with whipped cream & Enjoy! **You will have enough mix for 2 egg bite molds. You can stack them by positioning them carefully. ***After using your shot glass to set your graham cracker crust, make these delicious Pumpkin Pie Shots. ****You can absolutely not use the crust. I found that the crust kept my pumpkin pie bit together. It formed a nice little bowl for the pumpkin pie to sit in. If you would like to eliminate the crust, I would recommend placing your cooked egg bite molds into the fridge before popping your pumpkin pie bites out of the molds. Being chilled should make it easier to remove them. Looks great! You might want to revise and tell folks to use the rack in the IP and how much water to put in the bottom. I plan on making these bites but just want to confirm the cooking time of 35 minutes on High Pressure is correct …. it seems like a long time ….. will be watching for your reply …. thanks! yes 35 min 🙂 Enjoy them! Can you mix this in a blender? These look amazing. Just got my molds today from Amazon and can’t wait to get started! One question: on all the egg bite recipes they say to cover molds tightly with foil when putting them in cooker. Is that just because they’re eggs? Why doesn’t this recipe have you cover with foil? Just curious… 62 and still learning! I believe you should be fine substituting with evaporated milk. TO keep gluten free just eliminate the crust completely. To help with removing the bites from the molds when they are finished, try cooling them in the fridge first. They are just a tiny bit harder to remove without the crust. it won’t cook crispy in the IP. You can try without the crust. I just found that removing them from the egg bite molds was much harder without a crust. If you do without a crust, put them in the fridge to cool before removing them from the egg bite molds. They will be easier once cold, than when warm. I’m making this right now. My only concern is does this recipe really only make 6? I have so much batter left over after filling the instant pot bite mold. I have a 3 quart size and so far haven’t found any molds to fit it. Can I make this recipe any other way? Yes, put it into anything that you can fit. I used my leftover batter and graham cracker crumbs and put them into a ramekin. It was delicious. Have you tried these using whole milk instead of evaporated milk? If not I will try it as I am not a fan of evaporated milk. MY 4th generation pumpkin pie recipe uses milk. 75 and still trying and learning.